In Phone Platform Wars - Wasting Time on Trivialities, I expressed befuddlement at the unnecessary vitriol that people had been directing at others who do not use the same mobile platform that they do. I have noticed in the past two months that this vitriol has become even more pronounced. In one case, a person that decided to try an iPhone 5 received death threats from her Android-using followers (see Ashley Esqueda's Google+ post from September 11, 2012) despite the fact that she was and is an avid Android user and wanted to try the other platform for a second phone line. In another case just this past week, William Shatner's announcement of new app initially appearing on the iPhone platform got beat up because there was no Android version yet -- only 5% of the comments were about the app itself (called Shatoetry); the remainder devolved into Android fans bashing the "i" products from Apple (see here for an example). While later posts tended to be from his own fan base versus fans of Android, it was jarring to see those comments vilifying a person for not having an application on their preferred platform first and ripping apart the competing platform. 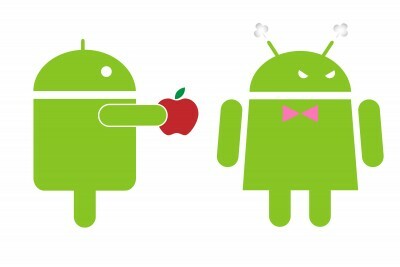 Android users do not have a lock on such lunacy, despite the source for my two examples: Apple users can be just as bad. A survey by Business Insider from April 2011 had an interesting statistic (as of that date, of course): 55.7% of Android users would never buy an iPhone because they "hate Apple," while 23.8% of iPhone users would never switch to another platform. The survey questions did not list Google or any other company as a reason to not switch off the iPhone (iOS) platform and the questions may have caused some bias in the responses. Nevertheless, it is interesting that there are people that would never switch to an opposing platform even if they provided superior functionality and/or services. What happens if the platform substantially deteriorates, like Blackberry's did? Would they still not switch? What psychological drivers are at work here? Perhaps there is some sort of platform attachment psychosis in play or perhaps some of these individuals were personally burned when using the competing platform. Maybe they are just surer of themselves than I am. As an eight year Blackberry user that switched to an iPhone earlier this year, I can tell you that Apple does not have a lock on my business: if I find something better when my contract is up, that will be the next smartphone for me. Another question: For someone that would never switch to a competing platform, why would a subset of these individuals also believe they need to evangelize the platform of their choice? Perhaps this is the more interesting question of the two. I presume the corporations involved with these mobile platforms are not paying these people. Does the relative anonymity and ease of creating comments on any topic somehow circumvent a more moderated response? I have seen this in other settings beyond the Internet and social media (for example, on the phone versus in person), but what drives a person to turn off their self-regulation is still a mystery to me.